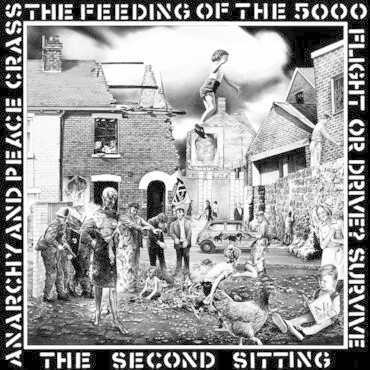 The Feeding of the 5000 is the first album by the anarcho-punk band Crass. The album was recorded on 29 October 1978, by John Loder at Southern Studios and was released the same year. It was considered revolutionary in its time due to what was considered an extreme sound, frequently profane lyrical content and the anarchist political ideals in the lyrics. The album is considered one of the first punk albums to expound serious anarchist philosophies. Crass helped reinitiate the influence of the Campaign for Nuclear Disarmament and the wider peace campaign in the UK with the songs like They've Got a Bomb, Fight War Not Wars and the adoption of the CND Symbol at their live concerts. They've got a Bomb also has a period of silence within it, inspired by John Cage's 4'33. The band have acknowledged the influence of Cage, and said that the idea of the space in the song, when performed live, was to suddenly stop the energy, dancing and noise and allow the audience to momentarily "confront themselves" and consider the reality of nuclear war. "The feeding of the five thousand" is a well-known phrase in Christian tradition, being the name of a Biblical miracle in which a small amount of food is said to have fed 5,000 people. According to the band's drummer and spokesperson, Penny Rimbaud, "We named the album The Feeding of The Five Thousand because 5,000 was the minimum number that we could get pressed and some 4900 more than we thought we'd sell. Feeding is now only a few hundred short of going golden, though I don't suppose we'll hear too much about that in the music press".